Ferrets are becoming more and more popular as a pet and it’s no wonder why. They’re cute, they’re full of energy and they love interacting with people. But they are not the caged pet many pet stores make them out to be and require more care than many people expect. Along with that care, they also cost more than expected. To give you an idea of what it costs to add a ferret to your household, I made a list with prices (sometimes a range of prices) of what it would cost for you to purchase everything you needed to get them set up. The prices shown are general prices and can vary depending on location and brand. The Cage- $90-$250 The minimum size cage for 1 ferret should be about 2′ by 18″ by 2′; the bigger the better. It pays to do some research as many people end up purchasing multiple cages until they finally get the one that works for them (The Ferret Nation is my favorite). Litter pan-$3-$10 You will need a litter box that is big enough for a full grown ferret to get into and turn around, plus that you can get in and out of the cage to clean. You may find you need a couple of boxes if your cage has different levels. Hammock and Other Bedding- $5-$20 each There are many different styles of bedding to choose from. It’s best to have several so you can change them out for washing. Ferret Litter-3.00-7.00 Newspaper and wood pelleted litters work best for ferrets. Toys– Ferrets are always on the go. Toys help keep them busy and away from your stuff. Ferret Food- $7-$16 for a 3-5lb bag Ferrets require high protein, low carb foods. It’s best to feed a mix of 2-3 different brands of food as ferrets can be hard to switch to a new diet. This can be a problem if your ferret only eats one brand and that brand is hard to find or worse discontinued. MD Ferrets Paws has a food comparison chart to help decide on what brands to feed. Oil Supplement-$3-$10 Fatty acid supplements help keep the skin from getting dry and the ferrets love it so it’s a great treat. High Calorie Supplement- $3-$7 Unfortunately ferrets are prone to illnesses and having a high calorie supplement to give them at that time is a good idea. It’s best to get them used to it before they are sick and give it to them occasionally so they continue to stay familiar with it. Hairball Remedy- $2-$5 Just like cats, ferrets can get hairballs. Hairball remedy helps prevent problems with hairballs. Vaccines– $30-$60 a visit Like puppies and kittens, ferrets need distemper and rabies vaccines. Distemper is usually given beginning at about 8 weeks and given every 4 weeks until they are 4 months old. Rabies is given at about 4 months old. These are then given on a yearly basis..
Add this up and you find that a ferret can run you about $213.20 to $866.00 and that’s with getting just one of each item above. And this is just the beginning. Food, litter, vaccines and supplements will need to be bought through the year and you may need to replace other items over time. 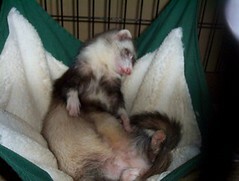 Ferrets are prone to several illnesses which need vet care to help maintain. So if you think ferrets would be perfect for you, just keep in mind that they can put a dent in your wallet. Still thinking about getting a ferret? 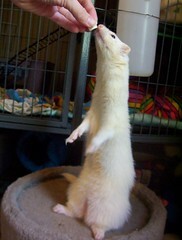 Visit my Squidoo page- So You Think You Want a Ferret, to see if they are the right pet for you.